Oriental Plantation located on Smith Creek is one of the nicest and fastest growing subdivisions near Oriental. It is less than five minutes away from the town of Oriental either by boat or car! Two ponds greet you on either side of the subdivision entrance. Very well landscaped, this neighborhood features a divided road with an island separating either side. Plantation style streetlights line the winding roads and add to the cozy atmosphere. Half of the homes in Oriental Plantation are located directly on the water and provide access to Green Creek and ultimately the Pamlico Sound. Planned amenities include community boat ramp, pool and clubhouse. Water access through the community boat ramp is just a short drive, giving access to the Neuse River and the ICW. Most (if not all) of the homes and lots are heavily wooded with tall pine trees and provide plenty of privacy. Oriental Plantation large waterfront lot (with a boat slip) prices start from $49,990. For maps, directions, prices and more information contact us today. Oriental, NC is known as the “Sailing Capital of North Carolina” The town supports this statement with 875 residents and over 2,700 boats! There is an estimated 5,000 to 6,000 Intracoastal Waterway travelers to Oriental each year. 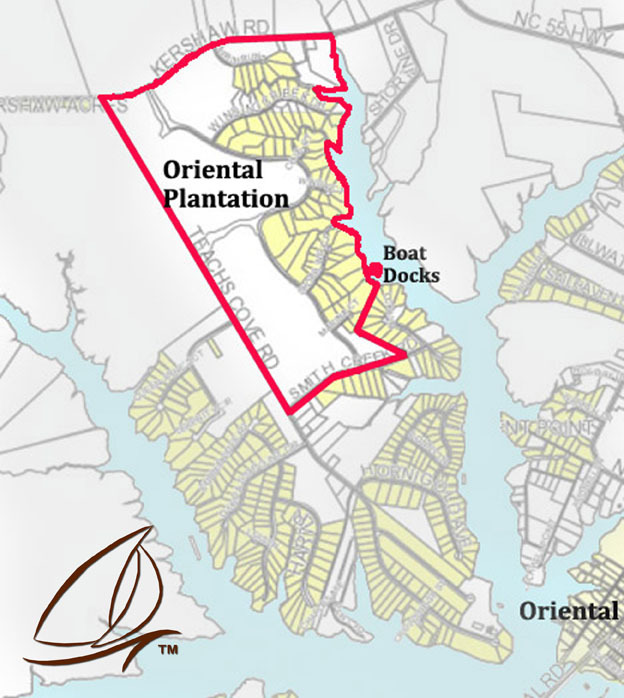 Oriental is located in Pamlico County, just below where the Neuse River connects with the Pamlico Sound. The Pamlico is the second largest sound on the East Coast after the Chesapeake Bay. Fishing and farming use to be the primary industry. Today tourism, real estate, and boating/fishing related businesses lead the local economy. Oriental is considered to be one of the premiere locations along the Inner Banks. It is ideal for and anyone desiring an upscale but laid back waterway of life.